It seems that Central European cineastes needed at least a couple of decades to get to grips with national struggles for reconciliation after 1989. The Czech drama Kawasaki’s Rose, which was submitted for Best Foreign Language Film at the 83rd Academy Awards, blazed a new trail. As well as dealing with the same issue, both Jan Hrebejk’s Kawasaki’s Rose and Kret end up with scenes of everyday life that are disturbing in their banality. French-Polish director Rafael Lewandowki has put aside his accomplishments as a documentary film maker to direct a family drama dealing with the unpredictable effects of the ‘lustracja’ (political cleansing) campaign during the Kaczynski administration. In Lewandowki’s film, the ‘victim’ of the moral cleansing is former miners’ leader Zygmunt, aka ‘The Mole’ (Marian Dziędziel), who is accused of having covertly supported the bloody pacification of a protest under Martial Law. Zygmunt, tried and convicted by the media, decides to relocate from Bielsko-Biała to the Nord-Pas-de-Calais region, where the largest Polish diaspora in France is to be found. Paweł (Borys Szyc), who does not believe the charges against his father, is married to Kasia (Magdalena Czerwińska) the daughter of a miner killed during a strike. 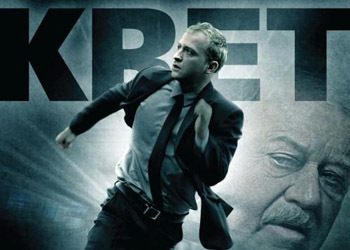 Kret evokes the witch-hunting atmosphere and climate of mutual suspicion of the period beautifully. Szyc takes the lion’s share of the credit as the tormented Paweł. Lewandowski’s drama, which was ludicrously marketed as a thriller, honorably represented Polish cinema at the Montreal World Film Festival. It is no wonder that the need to direct a feature about the 1970 protests in Poland and their unarmed victims came from a director belonging to the same generation as the workers who were slaughtered in the Baltic cities. Antoni Krauze is almost a contemporary of directors such as Krzysztof Kieslowski and Agnieszka Holland, who radically reinvented Polish cinema in the 1970s. The idea behind Czarny Czwartek originated with the script’s co-author Mirosław Pepka, who convinced Krauze to examine the same ground that Andzrej Wajda had covered exactly 30 years earlier in The Man of Iron (1981). The movie was shot in Gdynia, one of the epicentres of the protests, and features an impressive number of walk-ons that help to achieve a spectacular but gritty authenticity in the riot scenes. Krauze employs a moderate quantity of blood, in keeping with the gory nature of the original script, which was based on accounts from the local hospital staff who treated 1,100 people in December 1970. Czarny Czwartek is more than a collection of crowd scenes focusing on several shameful and relatively unknown aspects of those dark days, such as the suspiciously rapid and semi-clandestine burial of the victims. Krauze also tries to give some political insight into what was happening behind the curtains that pushed the Communist leadership to stamp on the revolt. The resonant voice of First Secretary Władysław Gomułka (Wojciech Pszoniak) reporting a phone call from the Soviet Union to the Party faithful presages the brutal baptism of a freedom movement that was still a long way from its final triumph. It’s hard to believe but, once upon a time, Polish experimental animation was a relatively common phenomenon. Many of its finest examples were broadcast late at night on Polish state television well into the 1980s. This was also the decade in which Zbigniew Rybczyński’s animation Tango (1980) won an Oscar that brought some international recognition for a Polish cinematic tradition that had been flourishing since the late 1950s. The success of animated film in Poland had its roots partially in the graphic tradition of the Polish School of poster art. This scene included artists such as Jan Lenica and his collaborator Walerian ‘Boro’ Borowczyk, who later went a different way after settling in Paris. Labirynt was Lenica’s first major effort without Boro and is widely regarded as one of the greatest animated features of all time. This cutout animation for adults recounts the strange journey of a fin-de-siècle Icarus, equipped with a bowler hat and mechanical wings, who lands in an apparently deserted city. After failing to rescue his bourgeois princess from a reptile, with whom she is in love, the Chaplinesque character is kidnapped and brainwashed with steam-punk devices wielded by a low-key Big Brother. Lenica’s tale is imbued with a pessimism that would not have been tolerated in a Western animated feature. Labirynt is one of the most striking metaphors for totalitarism in the history of animated film and a revelation for anyone of the Toy Story generation. ← Perspectives on Poland: The death of Catherine Z.